Mason Jar Canning Jar Lid Lighting Kits for INSIDE of jars include everything needed to turn your canning jar into a novel Hanging Lamp Table Lamp or a Night Light. 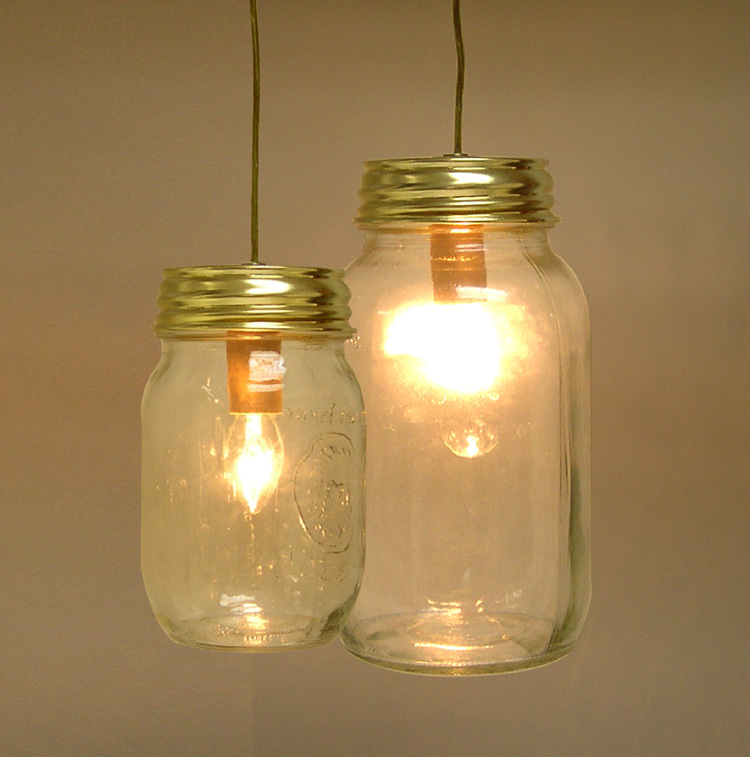 Kits Replace Canning Jar Lids To Make Country-Style Accent Lighting. Just add your small-mouth Canning Jar. WE SUPPLY THE LID. Kits come with pre-drilled brass finish metal lid that fits small-mouth canning jars with openings approx. 2-5/8" across. Includes On/Off Switch that can be placed anywhere along power cord. Power Cords have 2 prong polarized molded plugs. ASSEMBLY REQUIRED: Kits include assembly instructions. Night Light Bulb Size: UL recommends a maximum 4 watt bulb be used. 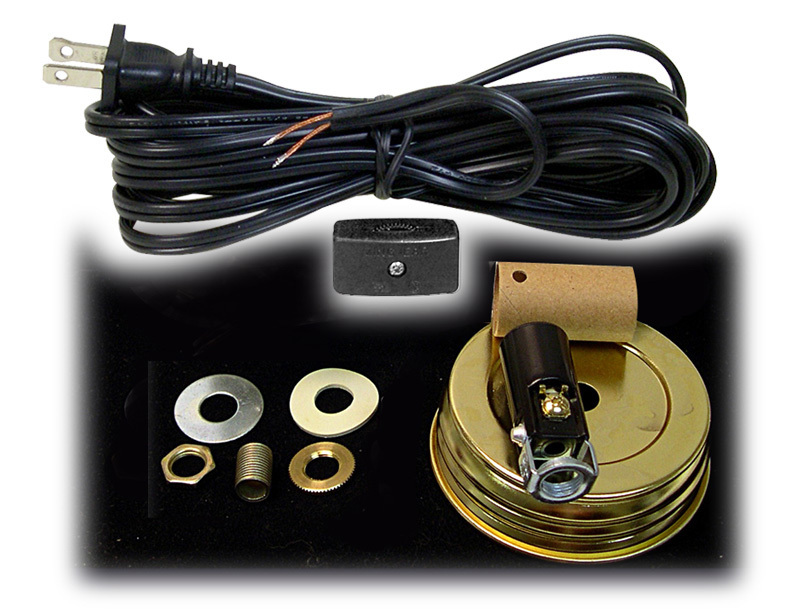 with 15 Ft. Spt-2 Black Cord, black Wheel-Type On/Off Switch, Bright Brass Finish Pre-Drilled Metal Lid, Phenolic Candelabra Style Socket and Mounting Hardware. with 8 Ft. Spt-1 Transparent Gold Cord, Brown Wheel-Type On/Off Switch, Bright Brass Finish Pre-Drilled Metal Lid, Phenolic Candelabra Style Socket and Mounting Hardware. 7-1/2W Clear Tapered Bulb, 8 Ft. Spt-1 Trans. Gold Cord, Brown Wheel-Type On/Off Switch, Bright Brass Finish Pre-Drilled Metal Lid, Phenolic Candelabra Style Socket and Mounting Hardware. 15W Clear Tubular Bulb, 8 Ft. Spt-1 Trans. 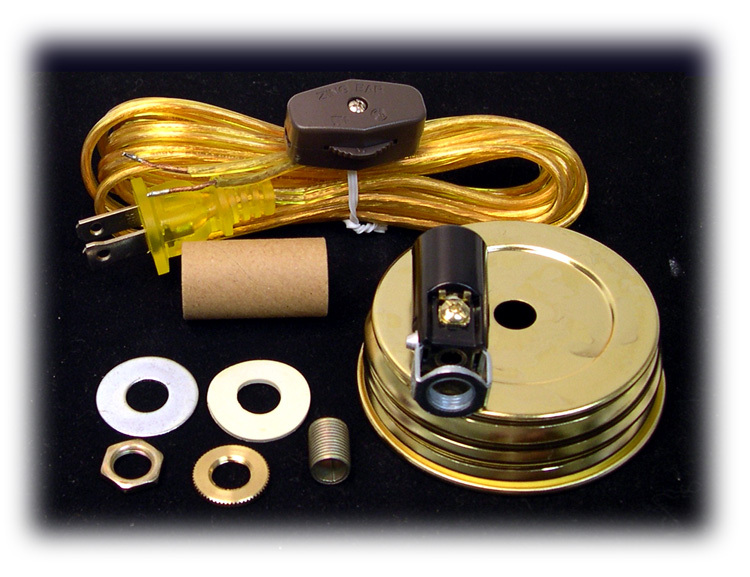 Gold Cord, Brown Wheel-Type On/Off Switch, Bright Brass Finish Pre-Drilled Metal Lid. 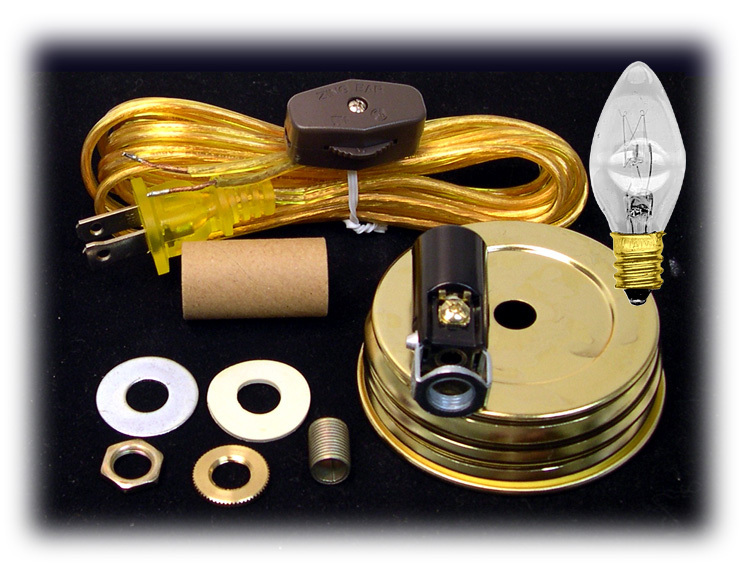 with 4W Clear Bulb, 8 Ft. Brown Cord with In-line Wheel-Type On/Off Switch, Bright Brass Finish Pre-Drilled Metal Lid, Adjustable Phenolic Candelabra Style Socket and Mounting Hardware. (D) Mason Jar Lid Lighting Kit with 8 Ft. Clear Gold Cord & 15w bulb. 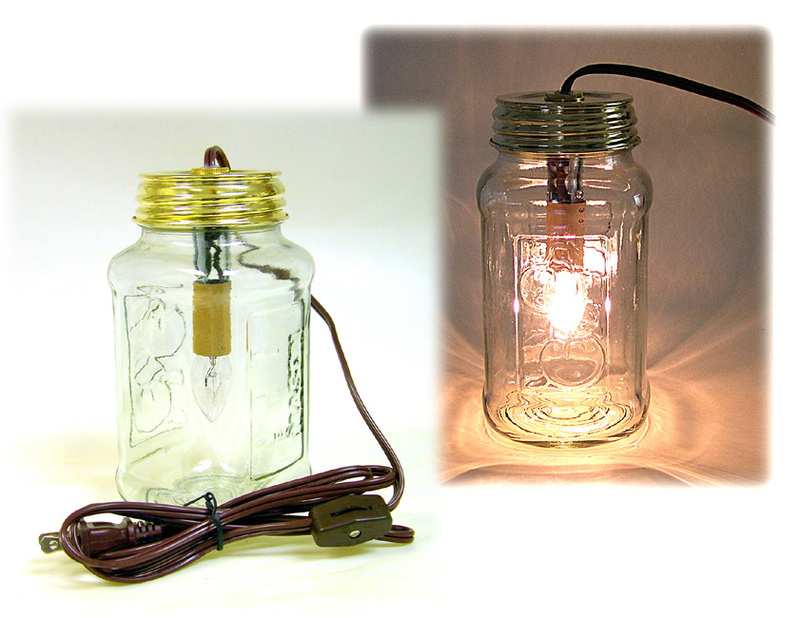 Mason Jar Lamp Making Kit. Turns canning jars with 2-5/8" openings into charming accenting lights. 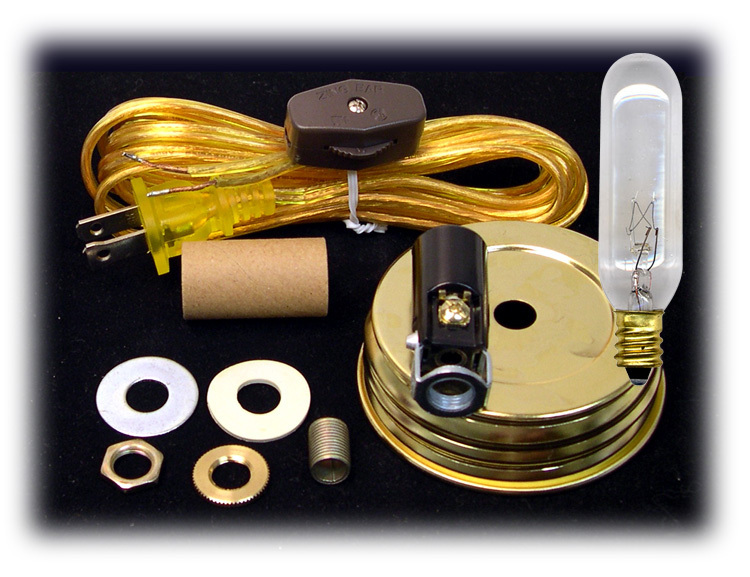 Includes bright brass plated replacement lid, 15 ft. black power cord with polarized plug, on/off switch, phenolic candelabra socket, mounting hardware and assembly guide. For indoor use only. Mason Jar Lamp Making Kit. Turns canning jars with 2-5/8" openings into charming accenting lights. Includes bright brass plated replacement lid, 8 ft. transparent gold power cord with polarized plug, on/off switch, phenolic candelabra socket, mounting hardware and assembly guide. For indoor use only. Canning Jar Lid Lighting Kit with 7-1/2W Clear Tapered Bulb, 8 Ft. Spt-1 Trans. Gold Cord, Brown Wheel-Type On/Off Switch, Bright Brass Finish Pre-Drilled Metal Lid, Phenolic Candelabra Style Socket and Mounting Hardware. Canning Jar Lid Lighting Kit with 15W Clear Tubular Bulb, 8 Ft. Spt-1 Trans. Gold Cord, Brown Wheel-Type On/Off Switch, Bright Brass Finish Pre-Drilled Metal Lid, Phenolic Candelabra Style Socket and Mounting Hardware.